If you have considered adoption for any length of time currently or in the past, you know that there are many questions to be answered before you can start the process. There are a lot of unknowns and confusing terms and complicated issues with adoption. And that's all before you're really in the thick of it! Believe me when I say that I know and understand! We prayed and thought about adoption for years before we finally committed to starting the process. It is a big deal and it certainly is something that you should take time to pray over and consider with your spouse or family. Here are some of the things you might want to consider if you think adoption may be in your future, whether tomorrow or years down the road. Domestic or International You probably hear these terms used in adoption lingo. I'm sure you understand what they mean (domestic means adopting a child from America, and International means adoption a child from another country), but you may not know what each entails. I'm sure there are positives and negatives to both domestic and international. Our family considered both, and honestly, I always thought we would do international. Maybe God has that in store for our future, but ultimately we decided on domestic right now. Things to consider when choosing where to adopt from: travel, costs, age of child, how comfortable you are with having a relationship with the birth family, length of time for the process, length of time for travel, your age, health, financial status, how long you've been married, etc. In thinking about travel, you will want to consider if you would even be able to do it. Some countries require multiple trips over, and some countries require you to travel for 2+ weeks. For some people this may not be possible because of job or family commitments. Some people also may not be comfortable traveling to another country for any period of time. You will also want to look at costs. While it is really hard to determine exact costs between different countries, or even within the states, different countries have very different fees. You'll want to consider the age of the child. I think it is highly uncommon, if ever, that international adoptions of newborns happen. Different countries adopt out children of different ages. My sister was adopted from China at 15 months old, and back then (12.5 years ago), that seemed to be pretty average for China. You are probably aware that in this day and age completely closed domestic adoptions are pretty rare (I'll talk more about this in a minute). You should consider how comfortable you would be with having a relationship with the child's birth family. Now, these relationships all look very different, but it is something to consider. If you are not at all comfortable with it, perhaps an international adoption would suit you better. You also will need to look at different countries requirements for you. All countries have certain requirements. Some countries might require you to be at least 30 to adopt. Maybe you need to be married for at least 5 years and have 2 or less children. Each country is different, so you'll want to look into those requirements. Open or Closed I just briefly mentioned above that few domestic adoptions are completely closed these days. So what do "open" and "closed" mean? I'll start with closed because it is pretty straightforward. A closed adoption is where the birth family and adoptive family have no contact. In a closed adoption, the birth mother may sometimes choose the adoptive family, but I believe it is unlikely that they would ever meet face to face, or if they do, they would not have further contact after the adoption takes place. She may also choose not to pick and then the agency would choose a family for her baby. An open adoption is more complicated because it looks different for each family. A semi-open adoption would be the next step of openness. In a semi-open, the adoptive and birth families may have contact only through the agency or another "middle man". I have heard of cases where the adoptive family sends pictures and letters to the agency, and they pass it onto the birth family. They might be one step more open, where they still use a middle man, but that person or agency connects them via a phone call, so they are not exchanging phone numbers. A semi-open could also mean that they have direct contact, but possibly have not shared identifying information such as last names, phone numbers, states of residence, etc. They may do this through a private blog, an email address set up only for them, or even a Facebook page just for that purpose. There are absolutely no statistics here, but I would say that based on all of the adoptive families I know, this one seems to be most common. A semi-open could also go further and mean that they do have identifying information, but don't talk all that regularly. Maybe they text once in awhile, but don't visit face to face. The beauty of a semi-open is that both families can find what works for them. It can also ebb and flow as time goes on. There is no hard and fast rule to what a semi-open looks like. An open adoption would mean that all information is shared and families have direct contact. This may mean they talk every day, maybe every week, or maybe just a few times a year. Again, it is going to be specific to them. An open adoption will also likely mean that they see each other face to face time and again. Maybe they live nearby and they are open enough for the birth mom to come over to the adoptive family's house for dinner, or maybe they only meet up annually for a weekend together. It all looks a little differently, and it is important to think about what you would be comfortable with. Do keep in mind that as your adoption process goes on, you may change your mind. I have heard of several stories where one or both parties wanted a closed until they met and formed a bond and both decided on an open! Just be aware that your comfort level may change. Infant or child Obviously a very important thing to consider would be what age of child you want to adopt. If you want to adopt a newborn, domestic adoption would likely be the right choice for you. You can also adopt older children domestically, usually through your state, or you may know it as foster care. Typically, children from other countries are at least a year or older at the time of adoption. They may be young babies when you first get a match with them (referral), but because of the processing time, it takes months to get over to that country sometimes. Older children and teenagers are also available for adoption both domestically and internationally. Of course, age range will vary from country to country. Private, agencies, consultants, OH MY! What do all of these things mean?! Well, when adopting domestically, you will use one of the above to go through your adoption process. Private--a private adoption would be where you are working word of mouth, through friends, ads, etc. to find a match with a birth mom. This would all be finalized through a lawyer when the time comes. Agency--This would be what you think of typically. Agencies can range greatly in size, from tiny local agencies with 2 people working them, to large agencies with offices all over the country. You would want to do your research and pick one that fits well with what you're looking for. Agencies work with you from start to end, usually doing your home study, matching you with a birth family, helping you finalize, providing counseling, giving support to the birth family and more. Consultants-- Using a consultant was a new approach to me when I first heard of it, but ultimately it was the one we chose. When you use a consultant, your consultant is the person in YOUR corner, advocating for you. They network with agencies around the country to find a match for you faster. Our consultant completed our profile for us, gives us advice, answers questions, gave us a list of financing options, and more. Once you are matched, you will ultimately end up working with whatever agency or lawyer that the birth family who chose you is matched with. The consultant doesn't take care of all of the details of the process, so you still need an agency or lawyer, but that will come after your match. Drugs, alcohol, mental disorders, special needs, gender, ethnicity and other considerations Before you begin the adoption process, you will want to consider all of these things. Gender will probably be the easiest. Either you'll have a preference or you won't. Ethnicity may be the next easiest thing to consider. Some people will only consider children of certain ethnicities, while others will take a child of any ethnicity. This would likely only matter in domestic, as you would probably know what ethnicity you are adopting if you go international. Other considerations would be if you would adopt a child who has been exposed to drugs, alcohol or cigarettes, either in the womb, or out if adopting an older child. This is a little more tricky, because there is a lot to consider there. Just as I said with openness, I suggest you keep somewhat of an open mind, as you may waver some as time goes on and you see and learn different things. At first you may think that you only want a perfectly healthy child, but you may change your mind, so just keep that in mind. If pursuing international, you may need to be up front with that right away because there are typically different programs in other countries for healthy or special needs/older children. In domestic, you can change your mind with time and each situation that you come across. Those are the things our family took into consideration while we prayed and talked about adoption. 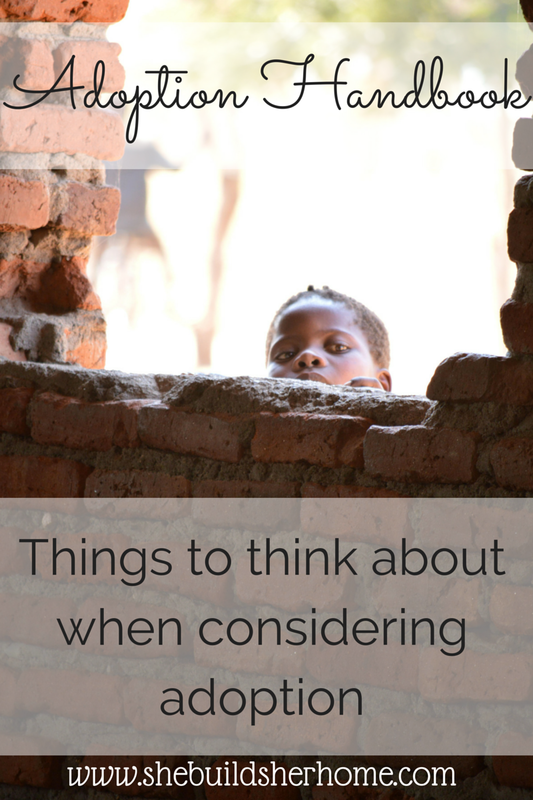 If you have been considering adoption in your future, I hope you found this helpful! Please let me know if you have any further questions about adoption that I can answer, or anything from this post that I could clarify. I would encourage each of you reading to at least pray about adoption as a possibility. Maybe you have never considered it or thought that you "couldn't" do it for various reasons, but I would just ask you to consider it. Not commit to it immediately, but just ask God if He might have adoption in your family's future. If He does, He will soften your heart to it. Maybe not right away, but He will.